We're pleased to offer legal advice to members from Founding Member and leading personal injuries lawyer Patrick (Pat) Brown. Pat is a Senior Partner at McLeish Orlando Critical Injury Law Firm and head of Bike Law Canada. Over the last 23 years, Pat Brown has represented fallen and seriously injured cyclists and other victims of road violence throughout Ontario. Not only is he a trial lawyer and past president of the Ontario Trial Lawyers Association, he has spent years as an outspoken activist who has fought for safe streets and changes to our laws. 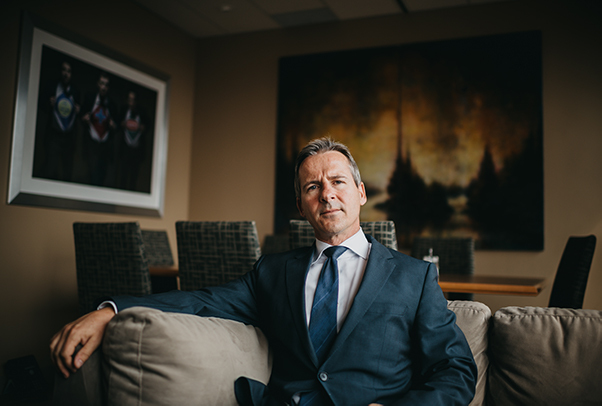 Although noted as a Certified Specialist, listed in Best Lawyers Canada, and LExperts Most Frequently Recommended Lawyers, he is most proud of being the recipient of the 2012 Active Transportation Champion of the Year Award by TCAT. Larger penalties for distracted driving, license suspensions, and better infrastructure are just a few of the things that Pat continues to fight for. He recently teamed up with McLeish Orlando and former NDP MPP Cheri DiNovo to assist in drafting Private Members Bill 158 , the “Protecting Vulnerable Road Users Act”. The law, if passed, would no longer allow small fines to be handed out when cyclists and pedestrians are struck down on our streets. Pat is part of the Bike Law network of lawyers and is one of the founding members (former director) of Toronto Bike Union (now Cycle Toronto). As a Platinum Business Member of Cycle Toronto, Pat provides free legal advice to all Cycle Toronto members who find themselves in need of help after a crash. Here are Pat's answers to cyclists’ questions when it comes to their safety and legal rights in sharing the road. If you have been involved in a cycling collision and need legal assistance, direct questions to pbrown@mcleishorlando.com. Someone will get back to you within 24 hours. You can also Tweet your questions to @PatrickBrownLLB and make sure you use in the hashtag #LegalSpin! Is it safe or legal to ride through crosswalks and intersections? P.B: No. A bicyclist must walk their bike through the crosswalk. Failure to do so may result in a fine of $85.00 under section 140(6) and 144(29) of the Highway Traffic Act. Cyclists must also obey the standard traffic rules at an intersection, i.e. stopping at a red light or stop sign. If I go out drinking, is it against the law for me to ride my bike home? P.B: In Canada you cannot be charged criminally for riding a bicycle impaired. However, that does not mean that you cannot be charged with other alcohol related offences such as being drunk in public or careless driving. Riding a bicycle while impaired is not recommended as it is a danger to both yourself and the public. Am I eligible to receive help if I’m badly injured following a car accident if I was at fault? If I get hit by a car and have a head injury, but was not wearing a helmet, can I still get help? P.B: Yes. When a cyclist is injured in a collision with a vehicle, the injured cyclist will be entitled to make a claim for accident benefits regardless of whether or not the cyclist was wearing a helmet. In addition, the injured cyclist can bring a lawsuit against the driver. An injured cyclist is not precluded from bringing a lawsuit simply because they were not wearing a helmet. The Defendant may call evidence from a medical professional to seek to reduce the amount of the award on the basis that the helmet would have reduced the extent of the injury. If the helmet would not have made a difference, then there is no reduction. Do I have to show the police my driver’s licence if I get pulled over on a bike? P.B: No. You are not required to provide a driver’s license when stopped, however, cyclists must stop and identify themselves when required by a police officer by providing your correct name and address. Failure to do so may result in a fine under section 218 of the Highway Traffic Act in the amount of $85.00. For more, see Dealing with the Police and Tickets. If someone is killed on their bike by a car, is there any help for their family members? P.B: Yes. The spouse and dependant(s) of the deceased are entitled to certain amounts by way of accident benefits. A person who was the spouse of the deceased cyclist at the time of the collision if entitled to be paid a death benefit in the amount of $25,000.00. The dependant(s) of the deceased cyclist are entitled to be paid a death benefit in the amount of $10,000.00 which must be shared equally by all dependants who qualify. Where the deceased did not have a spouse at the time of the accident, the amount of $25,000.00 will be paid to any dependants of the deceased in equal shares.There is a benefit paid to cover the cost of the funeral, up to an amount of $6,000.00.The family members of the deceased bicyclist can also bring a lawsuit against the car driver as Family Law Act claimants. Once it is proven that the driver of the car was at fault, family members of the deceased have five potential categories of damages. What happens if another cyclist hits me and I’m injured? Can I sue? P.B: Yes. You can if the other cyclist was not taking reasonable care and negligently hits you. They may be responsible for any damages you sustain. What to do if you are in a collision with a motor vehicle? If you are in a collision and you a) call at the time of the collision and b) remain at the scene, Toronto Police Services will take the report onsite, even if the other party does not remain at the scene. New Hours of operation: Open 7 days a week all year, 6:00 a.m. to Midnight.